Architect/Urban Planner-in-training (but not really) currently working on a government-sponsored urban analysis of my hometown. (Very amateur) Photographer in my spare time. Veritable coffee addict. ‘Owner’ of a very moody cat. Have dabbled in fencing and archery. Known to take impromptu trips abroad – also known to somehow never miss a raid. Secretly enjoy vanilla ice cream but not really hyped for vanilla. Dungeon setup – Optimised for aoe + execute, this is an ideal dungeon all-purpose build. Potential alternative between Phoenix Flames and Flame On depending on affixes and azerite traits. AoE – Used in m+ and fights like Zek’Voz, this build provides a pretty respectable aoe damage (coupled with Arcane Pressure traits) Alternatives include Touch of the Magi instead of Reverberate for a hybrid aoe/ST build and using Arcane Orb instead of Overpowered if AoE is of outmost importance. All-purpose – The only real choice for frost is the Comet Storm vs Splitting Ice situation, which is dictated by the type of encounter and my role in it. Generally, priority damage and/or AoE means Comet Storm, extended cleave means Splitting Ice. For all three specs Intellect is currently king, so will be omitted from this list. The most non-intuitive of the bunch, fire currently heavily ignores crit in favour of the stable burst increase of vers and the big fat ignites that a higher mastery provides. Some crit isn’t a terrible idea though and it does make the spec much smoother to play outside of combustion (while also providing some bonus mastery during). Generally there’s no stats beside vers a fire mage should be hunting for since all of them are fairly close in weight. Not deviating too much from its Antorus stat prio, Arcane still relies heavily on high crit rate during its burst windows (Arcane Power + Rune of Power) for its output. The rest of the stats fall at about the same level with trivial difference in weights, with the exception of haste when it nears the breakpoints of 7% and 13%. Hitting the 7% mark allows for 7 Arcane Blasts in a single Arcane Power window while 13% functions in a similar way but only under time warp/bloodlust effects. As a general rule of thumb, frost likes some crit (closest to 33.3% the better) to make shatters reliably happen. It also likes haste too since it speeds up icicle generation as well as Glacial Spike cast time. Mastery, while relatively behind the other stats, is still quite strong and not to be ignored. Since we’re still in first tier stats aren’t as abundant therefore it’s ill-advised to ‘stack’ a stat, a good balance of all stats is ideal. Joined <Independence > as a social mid-tier through EN after being invited by a friend. Ended up joining the raiding team since the leadership wanted to ‘resurrect’ their mythic team. Volunteered for the role of ‘ranged role leader’ which entailed calling out ranged-related mechanics (e.g. Spellblade Marks of Frost) as well as examining logs/evaluating ranged player performance. Guild reached its peak around our Tichondrius kill and started declining from there on due to the officer team forming a clique/not wanting to recruit xrealm and deciding they didn’t care about Cutting Edge but would just raid for gear after all. Ended up leaving after progress was over, deciding to quit the game shortly afterwards. Sadly due to IRL (moving, new job) and in game (me leaving Independence) situations, I ended up skipping the majority of ToS. Came back about a month before Antorus, where I joined <Why No Love > after their GM approached me. While I wasn’t particularly fond of the game/didn’t have much motivation to raid at all, I was in friendly terms with people in the raidteam so decided to join. As luck would have it, about a month later the guild decided to stop raiding which resulted in me quitting again until mid December. Luckily for me I was already part of <The Middle> as a social (joined them back when I played in Why No Love). I joined them for their Imonar progression and was soon made main raider. Raiding with them was a brilliant change of pace since it was a properly fun experience, combining casual with some seriously skilled players. Sadly, around Aggramar (unsurprisingly) cracks begun to show, with a fair few core members either stepping down or outright leaving. During that time I offered to help the team by bringing my holy paladin for progress (which I pre-emptively geared) on the condition it would be a one-time thing and not a reroll. That, of course, (again, unsurprisingly) meant that I never got to play my mage for progress with them for the rest of the tier. While I could bear playing Holy Paladin and felt happy to help the guild, my true love was raiding with my mage. Due to that, I joined the FAT PANDA titanforge Friday mythic altruns as an xrealm trial, with which team I got my CE on mage (and all subsequent Argus kills). I am still a member of that team, however they’re currently not raiding due to the raidleader’s (Kira’s) main guild times overlapping with FAT PANDA’s. Naturally, since this is an altrun xrealm team they come in lower priority to my main raiding guild. Eventually we would also get a couple of Argus kills with The Middle as well, however the guild soon stopped raiding due to summer/end of expansion. Starting the first BFA tier I offered to reroll due to the guild ‘suddenly’ having 5 main mages. After a lengthy discussion with the raid leader I decided to go for Priest disc/shadow(rip). Despite having a very strong start/roster, eventually the team started facing issues (around heroic ghuun) where the weak healing comp combined with a slow learning curve of dps lead to a fair bit of frustration. The officer team promises on recruiting a stable healing comp were falling short as well since they seemed to be content with using me as a plug whenever needed. This, combined with a newly-found ‘serious-but not serious’ AKA ‘no fun allowed’ attitude during raids and the state of BFA reduced my willingness to play to dangerously low levels. Seeing as the raiding team was 27 player strong I decided to step down and take some time to see if I wanted to keep playing at all. I made a return earlier this week and realised that I’d much rather switch back to my mage since the priest left me unfulfilled. 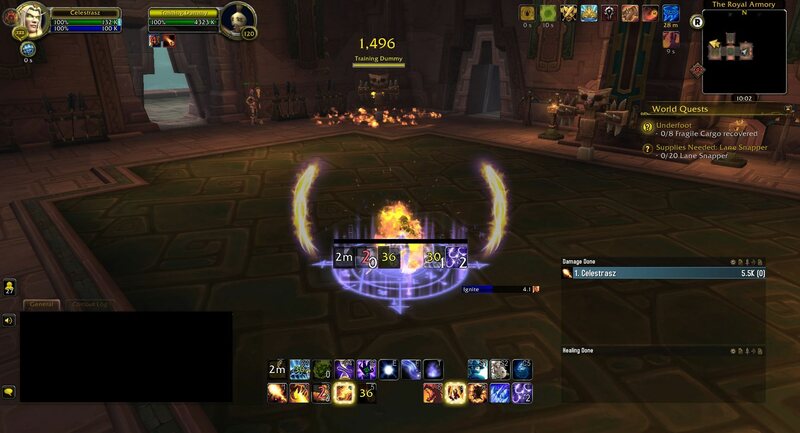 Combining the aforementioned attitude of the officers together with my strong desire to play mage again pushed me to look for a new raid team – so here I am. -No issues with the occasional benching, be it a rotation or due to my class not fitting in the night’s comp. It’s the best fun in the game. And that, naturally, includes the wipes. Watching the team shape up and beat a hard boss is a thing of beauty. Heard of you during some old raid runs/from friends currently in the guild. I will not name them here just because I’d rather this application be judged based on what is on offer. The guild has been in my radar for a while, the schedule is fine and I like the idea of raiding with a competent yet relatively chill team once again. However what REALLY sold me was your kill posters! I enjoy the odd m+ run (besides the compulsory weekly) but I rarely skip a day of logging in. While I do realise my mage is fairly behind gear-wise (and neck lvl wise) as of writing this application, I’ve already formed a m+ spam schedule to at least bring myself to ‘non dead weight’ status. Priority list currently is weapon>legs>trinket (balefire)>gloves>belt, based on stat allocation/current gear. While I'm willing and able to move and play both mage and priest I consider the mage to be my main for all intents and purposes since returning since it provides the enjoyment I'm looking from the game. I’ll be happy to answer any and all questions you might have and/or have a chat, please feel free to poke me anytime. Thanks for your application. I've copied it over to our members section for discussion. Well get back to you soon. Sadly we won't be able to offer you a trial. Good luck finding a suitable guild.